On Wednesday we held a webinar about Statistical Arbitrage Spread Trading. We had a lot of people tune in, and there were some great questions. Thanks to everyone who attended. If you missed it, you can see the replay at the bottom of this post. Statistical Arbitrage spread trading is a way to harness your inner Math Geek to make more money trading. There are a lot of mathematical concepts, but you can design your trading strategy to be very mathematically strict or just use the mathematics as a framework to exploit relative value opportunities. It is up to you and your trading style. In the webinar we discussed the mathematical concepts of cointegration, zscore, and half-life. We went through a real-life example using the spread 1*BOH - 2*PACW. You can bring up this spread in Spread Analyzer using this link. You can also look at some of the other spreads we talked about such as FDX and UPS, PEP and KO, or try coming up with some on your own. When you bring them up in Spread Analyzer, hit the "Tweet" button near the top of the output page and include my twitter id @slimshappy so I can see what spreads you are looking at. Please send me any feedback or questions on twitter or post them here. I hope you can attend our next webinar! In our pursuit of stock trading profit, we view securities being connected to each other by a spring force. This force is invisible but very powerful. When one security moves, other securities are pulled in the same direction by the spring force this stock exercises on other securities at varying degrees. Because the connection is flexible like a spring, the movements are not always 100% in sync, and that is where the trading opportunities come in. When you see one security moving, you can take a position in other securities connected to it. Understanding the force that connects them together is essential to exploiting the opportunity. Because there is a lag in the pull this force is somewhat predictive. Think about it this way: You are tenth in line waiting for a traffic light to turn green. I bet you that when the first car gets going you won’t be far behind. You may even find yourself stepping off the brake when you see the light turn green, you don’t wait until all the cars have gone through the light! With the elastic force, you can anticipate market movements ahead of the crowd, and elevate your trading to the next level. These laggish pulls have all kind of wonderful applications in pairs trading, signal building, options trading, and so forth. Depending on how you think about the spring force, you can find many different ways to interpret and exploit these opportunities. Can you think of one way to incorporate this in your trading strategy? Any contractor will tell you that you need to have an assortment of tools in your toolbox to get a project done. Each job requires a specific tool. When you need a Philips screwdriver, hammer just will not work. In trading, each of our strategies is a tool. Each one works during certain market conditions, but not every strategy can work for every market condition. Many people are struggling to make money this week because they are using bull market, low volatility strategies. There is a tendency to try to reinvent the tool, re-work it so it will be effective in all market conditions. Instead, I think it may be time to put some of those strategies back in the toolbox for the next bull market. Let's go back to the toolbox in search of some tools for volatile markets. For me, when volatility is increasing I find that I need to put on small positions and leave room to add more if levels get worse. I also find I need to let my winning trades run more. What trading tools do you use in volatile markets? Written by Jennifer Galperin. Follow me onTwitter and StockTwits. On Wednesday we hosted a webinar about Spread Trading Fundamentals. Below is the replay of the webinar. We had great turnout, including lots of first-time attendees. We talked about how to set up and trade spreads, and we discussed how to use Spread Analyzer. As I said in the webinar, if you are new to spreads then you have definitely come to the right place. Spreads (or pairs) can really help you visualize arbitrage opportunities where one stock is trading cheap and another is trading expensive on a relative basis, as I discussed in my CMS-DTE example in the webinar. 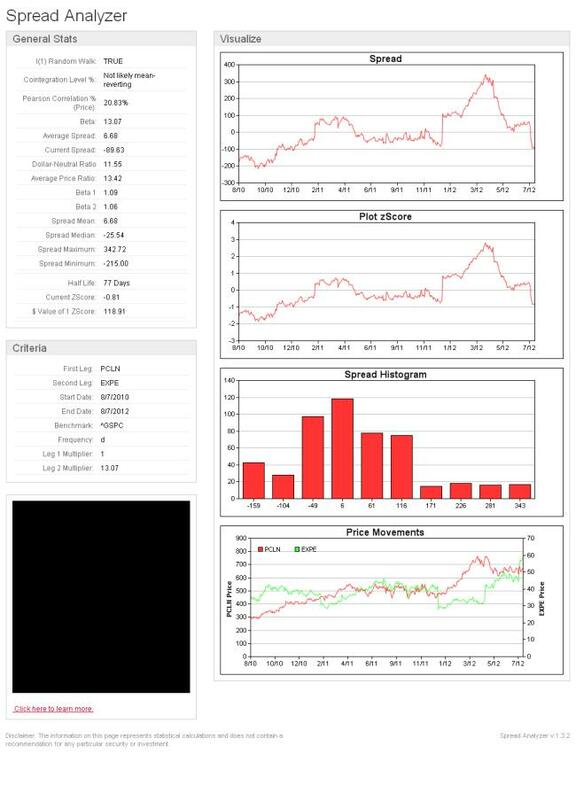 Our goal is to make it as easy as possible for you to trade spreads by providing all the tools you need for finding, tracking, and recording your spreads. Whether you are new to spread trading or experienced, we have tools that can help you. If you want more information about Spread Trading, please explore our site. Our How to Trade Spreads handbook is extremely useful to find out more about everything from spread trading fundamentals to more advanced topics like statistical arbitrage, cockroach theory, and more. Please click on SpreadTraderPro to find out more about SpreadTraderPro and the handbook. Please stay tuned for more Spread Trading webinars, including an exclusive bonus webinar later this month for SpreadTraderPro members only! Our next general webinar will be in early November. On Wednesday we hosted a webinar where I talked about my little tricks for profitable spread trading. We had a great group. If you missed it, you can see the replay at the bottom of this post. My favorite little trick is to combine two different types of metrics for finding good candidates. We went through the example of statistical metrics + fundamental metrics. I want to hear if you are trying this type of trading strategy, and how you are making it work for you. Please feel free to comment here to this post or send me feedback on twitter. Produced and written by Jennifer Galperin. Follow me on twitter and StockTwits. Tuesday in the after hour market, Priceline ($PCLN) reported earnings and gapped down 13%. Expedia ($EXPE) followed and went down 4% on the news. I quickly went to our Spread Analyzer to run a 2 year query on $PCLN versus $EXPE (see the results below). I noticed that the Pearson correlation of 20.83% was very low for the pair and that there was a good chance for $EXPE to bounce back some. I bought $EXPE for 56.5 and quickly flipped it for a $.50 per share profit. I was able to use the Spread Analyzer's stats to exploit the relationship between the two stocks. In this case I did not catch the falling knife, but used a non-correlated competitor to take advantage of the news. There are all kind of ways to use stats and pairs trades to make money. Anything you want to add? Earlier this week I had a great trade on $COH earnings. I was able to use the new features of Spread Analyzer to help me discover a good opportunity and capitalize on it in a seamless way. Here is a short video showing the trade and how I used the technology. If I had one trading video to recommend, Charlie D's trading video would be it. This video was created in 1989 and it is a must watch for all traders. I want to thank the trader on Twitter who lead me to it (unfortunately I can't remember who it is). Here is a cool example of how we applied Charlie D's advice recently. On June 28 after the market closed, this tweet from Aris David caught my attention. Our signal had a super strong buy signal going into the U.S. close and we were waiting for a dip to buy. After the market closed at 4pm, the S&P futures went down 7 points and we decided to buy a bigger futures position based on our signal and Aris' information. We thought someone new something about Europe given how the FTSE closed and the S&P selloff presented an attractive opportunity. We had more conviction and we committed. That is what spread trading is for us. Trading the relationships. Not only the statistical relationships between stocks, but information against information; a stock price against its intrinsic value; price against news. Spread trading is about exploiting two levels of potential energy and their relationship. The next day, the market went up about 2 percent. Someone knew and we exploited it. Do you understand why spread trading is so interesting? In this video, Jennifer discusses the tools we have added to our Spread Analyzer to make spread and pairs trading easy as a summer's breeze.